We are taking Visitation Volunteer Applications! Are you a young adult considering life after graduation? Does the idea of service and prayer, in the heart of the city, bring something alive in you? Are you called to explore your spirituality and be part of a social justice movement? 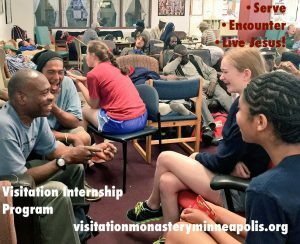 Consider joining us, the Visitation Sisters, for a year of service, study and prayer as a Visitation Intern in north Minneapolis. We are taking applications now for September, 2017. To hear more about the program, tune in to VIP Anna Dourgarian reflecting on her year with the Visitation Sisters in north Minneapolis. Nine Mendota Visitation High Seniors Encounter North Minneapolis Neighbors! 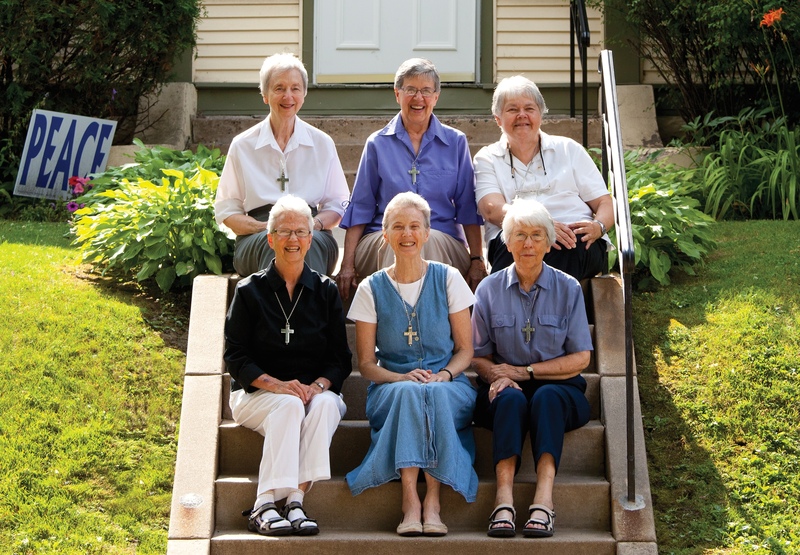 For the past 20+ years the Sisters have sponsored an INNER CITY IMMERSION EXPERIENCE in North Minneapolis as one of the options for Senior Project. It has been a wonderful opportunity for service in this community and to experience another part of town! The past three years we tried something new! We organized a mission trip right here North Minneapolis! Instead of going to Guatemala or Africa a group of 8 seniors discovered missionary territory right here in the city! 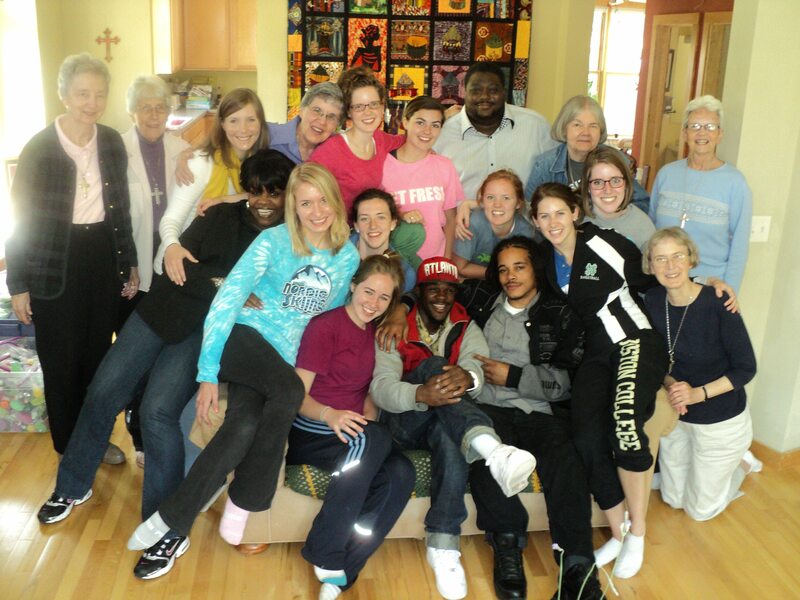 This year we have 9 Visitation women who will stay at our spirituality/retreat/meeting center in the neighborhood called the St. Jane House; a young adult Vis Alum will be staying with them and also and act as chaperone. They will have opportunities to spread the Salesian spirit of gentle presence. They will have an opportunity to build community with one another and with the Sisters. It will be lots of FUN & a great contribution to North Minneapolis! Generally, each day will begin with breakfast, prayer, and off to Northside Child Development Center for the morning where they will assist the teachers of 0-5 year olds. Over the lunch hour there will be speakers from the community to help them gain insight into the root causes of poverty, and also learn about many positive initiatives in place in our community. Afternoons include gardening, monastery jobs, help with computer skills at the local technology center, and maybe even Bingo at the Adult Day Care Center! The students will prepare and serve their meals, have time to reflect on the day, and even go out on a police ride along! Visitation’s school motto is “NOT FOR SCHOOL BUT FOR LIFE.” Our prayer is that this will be an experience they can carry throughout their lives. 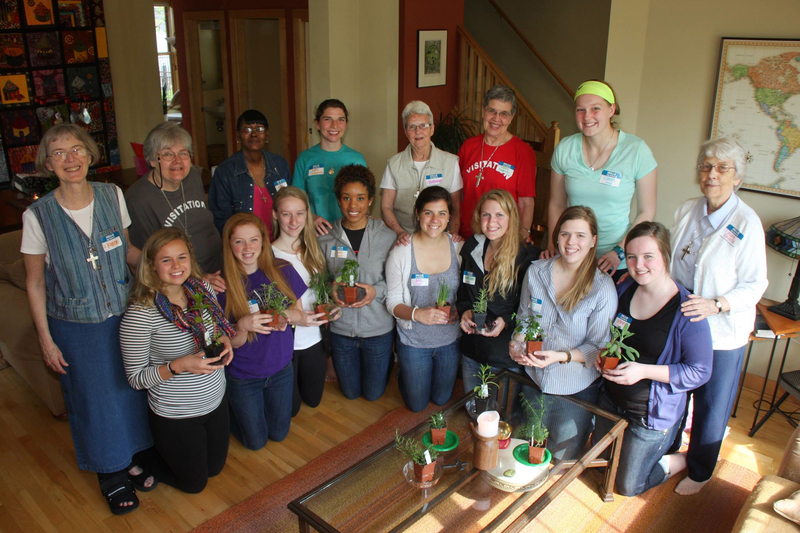 Click to hear more from past Vis Seniors on their Service Immersion Experiences. 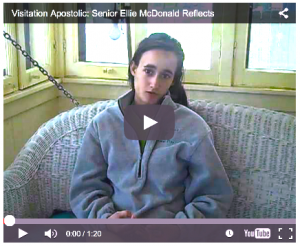 Visit our Video page to hear more from past Vis seniors on their Apostolic Service Immersion experiences. Monday 9/29: Brenda Lisenby arrived for Monastic Immersion Experience. Oblates of St. Francis de Sales, Fr. Mike Newman, and six novices arrived to spend the week, staying at St. Jane House. Tuesday 9/30: Fr. Mike and the guys spent the day with us, hearing our history and doing service around the monastery. Wednesday 10/1: Sr. Mary Mao returned from New York. The novices spent the entire day at Visitation School and Convent in Mendota. Thursday, 10/2: Foundation Day — Liturgy of Hours, Mass, Festive luncheon with representatives from each of our monasteries (Georgetown, Brooklyn, St. Louis) and Mendota Heights Visitation school, our Companions, Intern and the Oblates. Friday, 10/3: The novices and Fr. Mike joined us for Morning Prayer, meals, Adoration of the Blessed Sacrament and Mass. Saturday, 10/4 the BIG DAY: Celebration at Capri Theater with emcee Fr. Michael O’Connell, a slideshow by former Vis Neighbor, Jenny Larson, and keynote by Fr. Mike Newman; dancers from Lundstrum Center of Performing Arts; followed by an intimate pizza party at Girard and Brother Mickey presenting us with a new painting. The Novices and Mike joined us for Morning Prayer/Communion Service and were on deck the entire day to help in countless ways. Sunday, 10/5: Church of the Ascension went all out to celebrate us! Mass, gifts, reception.The Novices prepared our evening meal and farewell party/prayer; and the Sisters shared vocation stories with the novices in their own discernment. For those unable to be physically present with us, we invite you to visit any of the above links to photos of our guests, and video of our speakers, story-sharing, and reflecting. We are grateful for the work of so many hands, and the faith that has brought us to this moment. We don’t stand alone. On Monday, September 8, 2014, the Sisters and Visitation Companion Coordinator Jody Johnson convened our annual Salesian Second Monday series. This monthly event runs from September through April and includes a light pot luck supper and fellowship; followed by guided conversation around a topic related to Salesian Spirituality; and closes with Night Prayer. This year’s theme is “Holiness is for Everyone.” All are welcome! Drawing from the Vatican II emphasis on the laity, as well as the writings of St. Francis de Sales, we are considering what it means to be holy in any walk of life. We reflect on how Salesian virtues may be expressed in different kinds of vocations. To kick off the season focusing on (what the Church calls) the “universal call to holiness“, each Visitation Sister shared from her life, offering us some grounding insights on this theme. Click to hear Visitation Sister Suzanne Homeyer offer a few stories that illustrate holiness. To watch more of the Sisters reflecting on this theme of “Holiness is for Everyone”, tune into our Visitation Monastery YouTube Channel.